A source of sadness in my life is the lack of quality (and quantity, to be honest) Chinese food where I live. I'm actively plotting our next move to a city with a Chinatown (hello and hi). Until that happens, I've been making an effort to incorporate some of those flavors into meals at home. This chicken dish was the best stir-fry I've ever made, not that I've made many. The flavor was strong but not overpowering, and just the right amount of spicy (thanks to my most favorite condiment ever, chili garlic sauce). It's served with a crispy noodle pancake that's a novel alternative to rice. The recipe is from the Cooks Illustrated website, which is well worth the membership fee in my opinion. CI is part of the same company as my favorite America's Test Kitchen, whose cookbooks (with recipes that have been rigorously, scientifically tested to find the absolute best result) have never steered me wrong in the kitchen. 1. Bring 3 quarts water to boil over high heat in a large pot. Meanwhile, combine chicken, 1 tablespoon soy sauce, and 1 tablespoon sherry in small bowl; set aside. Combine hoisin, chili sauce, and remaining 1 1/2 tablespoons each soy sauce and sherry in another small bowl; set aside. 2. Add noodles and salt to boiling water; cook until just tender (do not overcook), 2 to 3 minutes. Drain thoroughly, then toss with white and light green parts of scallions. 3. Heat 1 tablespoon oil in 12-inch nonstick skillet over medium-high heat until shimmering, about 2 minutes. Spread noodles evenly across bottom of skillet; press with a spatula to flatten and cook until crisp and golden brown, about 4 minutes. Slide noodle cake onto large plate. Add 1 tablespoon oil to skillet; swirl to coat. Invert noodle cake onto a second plate and slide it, browned-side up, back into skillet. Cook until golden brown on second side, about 4 minutes. Slide noodle cake onto a cutting board; set aside. 4. Add 1 tablespoon oil to skillet; heat oil over medium-high heat until just beginning to smoke. Pour off excess liquid from chicken and add chicken to the skillet; stir-fry until just cooked, about 5-7 minutes. Transfer chicken to a small clean bowl. 5. Add remaining 1 tablespoon oil to skillet; heat oil over medium-high heat until just beginning to smoke. Add bok choy stalks and stir-fry 1 minute. Clear center of pan, add ginger, and cook until fragrant, about 10 seconds, then stir ginger into stalks; continue to stir-fry until stalks are tender-crisp, about 20 seconds longer. Stir in bok choy greens, chicken, and hoisin mixture; cook until greens are wilted and ingredients are coated with sauce, about 1 minute. Remove skillet from heat. 6. 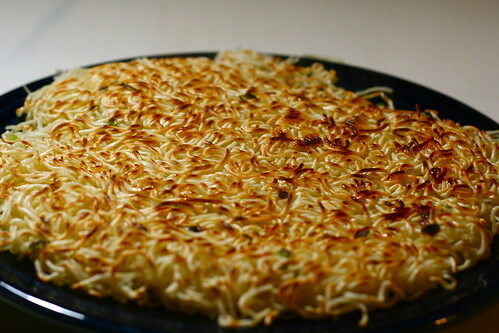 Cut noodle cake into 8 wedges. 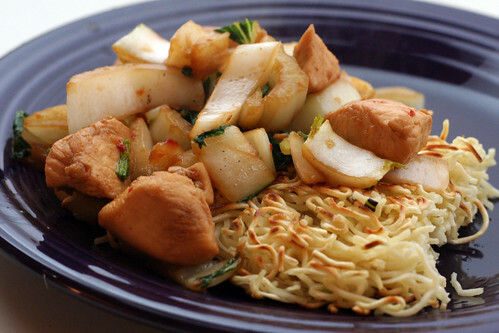 Place 2 wedges on each of 4 plates; spoon portion of stir-fry and sauce over noodle cake, sprinkle with scallion greens, and serve immediately. This looks really yummy =D. I love to stir-fry chicken! Looks delish! I'll be trying this recipe. You had me at crispy noodle cake! Wow that looks amazing. We have trouble finding good Chinese food nearby too. There are some great places in Boston (and we're just outside), but none are close enough to deliver to us. It's very sad! Amy, I share your thoughts about Chinese restaurants in our area. I would, however, suggest you give Lok Yuan a try at lunch time. Biggest bargain in the state! Not bad Chinese junk food. @Mary You're the 2nd person to recommend that to me recently, I'll have to give it a shot. My favorite in town is the vegetarian place, Lotus Garden on Charnelton. Thanks for the suggestion! I love this recipe! Or, er, something very similar. It's a spicy stir-fried chicken with bok choy and ginger, but some of the ingredients are a bit different (oyster sauce rather than hoisin, and a couple of others). Anyway, so good! I can't wait to try the noodle cake.